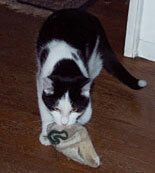 Martian & his beloved glove. 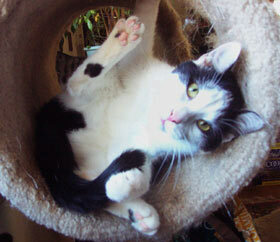 Martian is one of the most playful & unusual kitties at CR!FR. He got his name from the way he looks at the world; even as a tiny kitten he'd gaze out from his pen & watch everything going on around him in a very interested way. He became known as the "Martian Observer". Martian has many unique qualities: his supple body is more like that of a ferret, a slinky or a wet noodle. It's as if he has no bones, only cartilage. His meow is very loud, high-pitched & crystal clear & has a distinct phrasing that sounds kind of whiny, kind of shrill, definitely impatient. Always very loud. He used to lay down outside the bedroom at night & meow under the door. Very loudly. 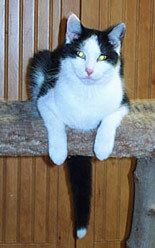 The tip of his tail is white, like a penlight, or lighthouse. 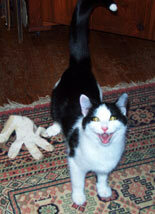 Martian has always been very playful. He has an active interior world & entertains himself for hours. Lately he's been obsessed with a gardening glove, which he carries around the house & flings up in the air. He has one of the loudest purrs at CR!FR, which is always a pleasure to hear.